There are few social theories on which a Victorian male scholar and a modern feminist would agree, but the suppression of women in Ancient Greece is one of them. According to the author, the tendency to mold history to fit a contemporary agenda has led to an overly pessimistic view of woman’s place in the ancient world. 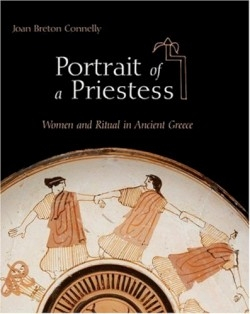 In this thoughtful study, Connelly contends that the power Greek priestesses wielded in their communities was not an exception to the rule, but rather a marker of the larger social, economic, and political role that women played. Referencing more than 100 images, Connelly charts the development and eventual collapse of the Greek female priesthood from the Archaic through the Early Christian period; drawing on epigraphic, archaeological, and literary evidence from South Italy to Asia Minor. Cults dedicated to individual goddesses were numerous in the Ancient Mediterranean and almost exclusively overseen by women. The author shows that these priestesses were considered primary authorities on sacred law and received various public honors including portrait statues, gold crowns, and reserved seats in the theater. Literary sources tell of priestesses consulted by kings on military strategy and sought out by philosophers for their divine and earthly wisdom. By highlighting individual historical figures as well as providing a general outline of priestly requirements, costume, function, and privileges, Connelly has created a valuable and comprehensive resource for scholars and amateur historians. The author received her doctorate in classical and near eastern archaeology from Bryn Mawr College and is currently associate professor of fine arts at New York University. Since 1990 she has directed NYU’s Yeronisos Island Excavations project on Cyprus and she is the author of Votive Sculpture of Hellenistic Cyprus. Her numerous awards include a MacArthur Fellowship, a Metropolitan Museum of Art Classical Fellowship and an appointment to the United States Cultural Property Advisory Committee by President George W. Bush. Some of the book’s most enlightening portions draw broader conclusions about woman’s place in the Ancient Mediterranean and the impact this had on later cultures. Connelly warns against the urge to view Greek religion through a Judeo-Christian lens, emphasizing that issues of female “uncleanliness” and virgin worship had no place in the cult. She suggests that early Christianity’s gradual exclusion of women from the priesthood was in many ways a direct response to the formidable influence priestesses had in the Greco-Roman world. In comparison, the text’s concentrated chapters on priestly life can feel tedious at times, but the knowledge gained is significant. By re-examining evidence that has been misinterpreted and overlooked by other scholars, Connelly not only illuminates the role of women in the Ancient Greek cult, but also offers telling insights about those who study them.